Welcome to Thursday! Whether the days have been breezing by or crawling, the weekend is in sight. And I’ve got another spectacular freebie to share with you to get you pumped for a weekend of non-stop partying…or catching up on housework (can you guess which category I fall into?). 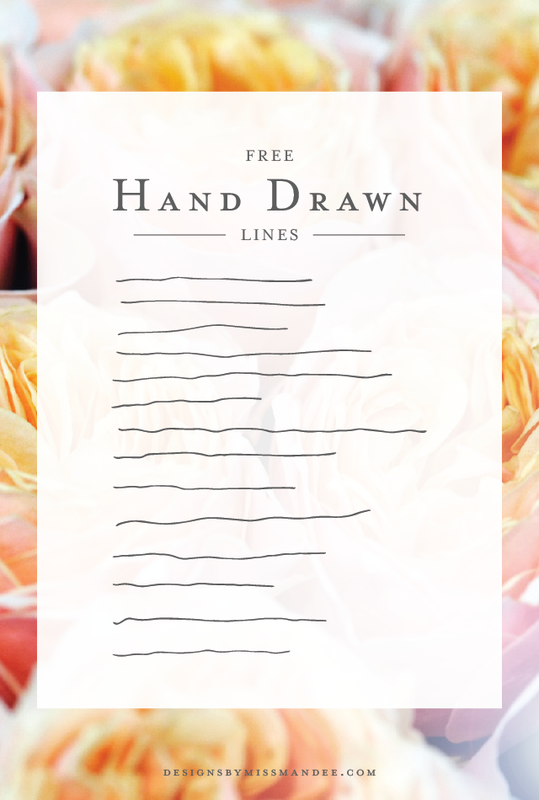 Download these simple hand drawn lines to add a crafty touch to your next design. So, right now you’re either thinking, “Hand drawn lines, that’s stupid: what would I even use these for?” or, “Oh sweet! I’ve got about a million and a half ways to put these babies to use.” Hopefully you’re part of the latter group, but if not, no hard feelings. As you probably know by now, I’m a big fan of hand drawn design elements—flowers, snowflakes, banners, you name it! Whether they are making a big statement, or just adding a touch of whimsy, hand drawn graphics can be a perfect touch to make a design go from that’s nice to LOVE it. I can’t tell you how many times I just need something as simple as a hand drawn line to add to a design. They make great borders, dividers, or flourishes to break up space. That’s why I decided to create these; so that I would have a little stockpile of imperfect, sketchy lines handy for future designs, and, of course, I just had to share them with my lovely readers. Also, if you’re gearing up for spring, be sure to check out the post I shared earlier this week: Easter Dingbat Fonts. There’s lots of cute bunnies, Easter baskets, and baby chicks just waiting to star in your next spring design. Who doesn’t love a good dingbat font? I was just looking for something like this last night! Yes, sometimes you just need an artsy line 🙂 Thanks Mandee!! I don’t know where I’m going to use them but I’m sure I will use them in some way! I always love your designs! thank you for another freebie! Thanks for your fun freebies! I’ll make sure to give a shoutout when I use them! Over here from 2usestuesdays linkup. Thank you so much for all of your graphics!! I am not a designer at all but I am making some things for my friend’s wedding and these are beautiful and perfect. I can’t wait to use the Christmas ones for something!